No more leaning across the vanity to get close to the mirror! 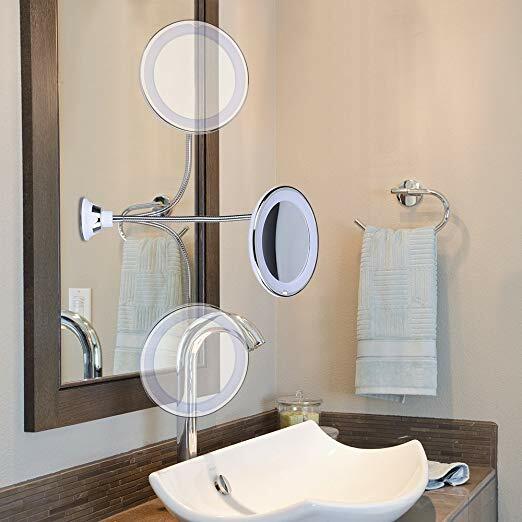 This vanity mirror with lights sticks to your wall mirror and comes out to you so that I can stand up straight while putting on makeup. You don’t have to climb onto the vanity to get up close to the mirror, you can stand up in front of the vanity and adjust the height via the gooseneck to find those perfect viewing angles every time! The purpose of the 10X mirror with lights is to magnify and see more detail, and this kind of mirror work well only when you get close to it. The recommended distance for using out makeup mirror with lights: ≤ 3~4 Inch. Great for those with poor eyesight or want to focus in on every pore without distortions! Maintain a clean look in your bathroom, by taking our makeup mirror down every morning and putting it in a drawer, and putting it back up again the next morning. It adheres to the mirror very well and comes off easily. 360° rotation with locking suction cup provides a secure attachment; fully adjustable to any desired position. Natural daylight LEDs that will last for 50,000 hours and provides the natural light you will encounter throughout a day. Powerful 10X magnification with 14 bright LED lights allows you to focus in on a specific section of your face - ideal for makeup applications and precise tweezing.